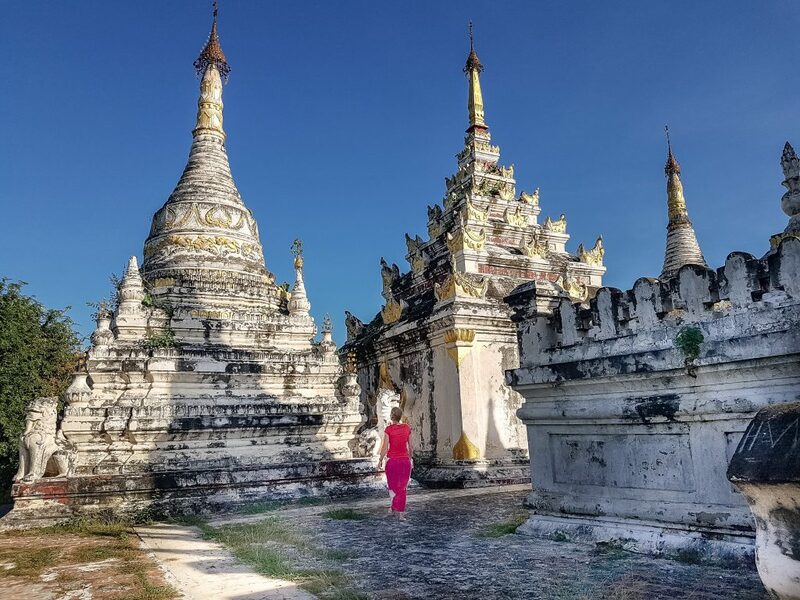 Cycling in Myanmar – not the first destination you would think of for a cycling holiday 🙂 Still, it can be very rewarding! 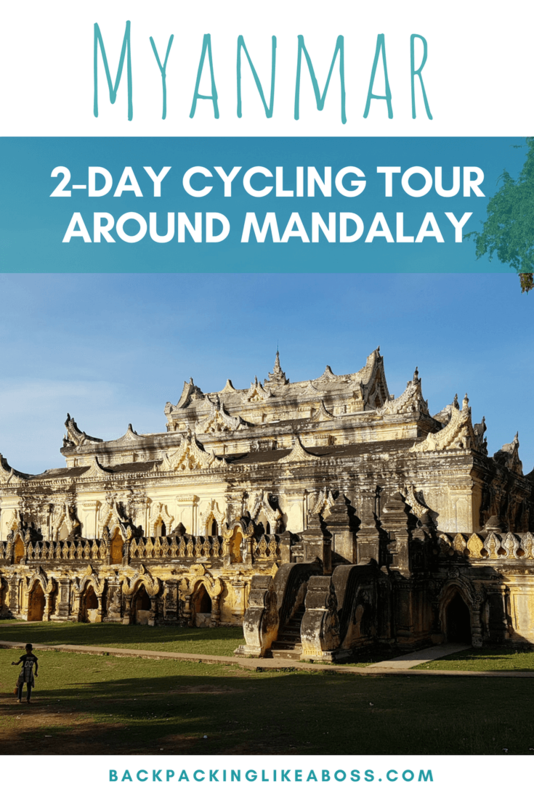 During my 3 weeks in Myanmar, I did a 2-day cycling tour around Mandalay. 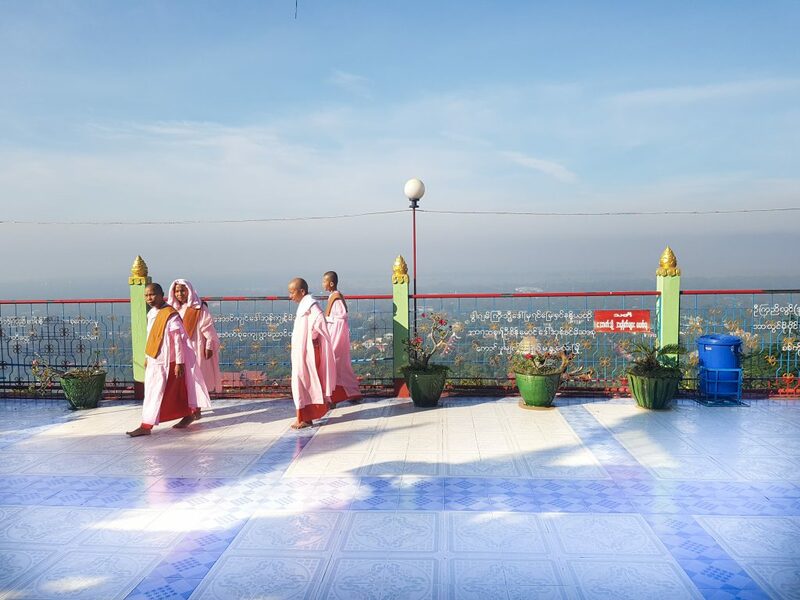 With the tour we would see some highlights of the area around Mandalay and visit the old royal capitals of Myanmar. The people in Myanmar are quite fond of cycling themselves. You see bikes both in the cities and the countryside. But the traffic in the cities is getting increasingly horrific and it does not look very safe! 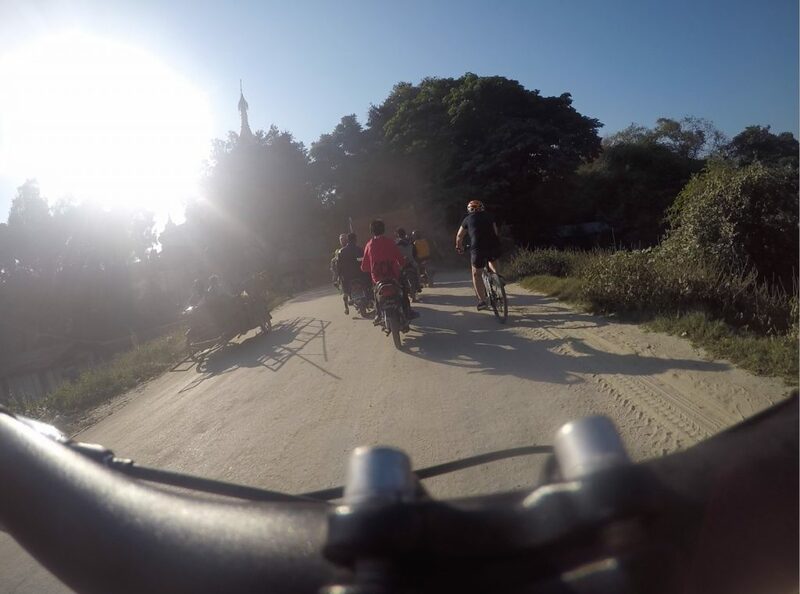 During our trip, we had to get out of Mandalay and cycled for about 30-40 minutes in quite heavy traffic on a dusty road. We left the Awareddy River View hotel in Mandalay and after cycling about 45 minutes through the crazy traffic of the city, we arrived in Amarapura. In this town, we visited the famous U-Bein Bridge. Fun fact: world’s longest wooden bridge does not have water underneath it outside of the rainy season. Instead, lots of vegetables are grown on the fertile ground. Many people make the daily commute along the 1,2 km bridge everyday from the village every day to come sell souvenirs to tourists. Although a bit busy, it was still a cool place to see! We were here during the day, and some people went back for the sunset by tuktuk. You can rent a boat to get a good view. From this point on, it would get quite hot! I was very happy with my hat, my sarong and sunblock! 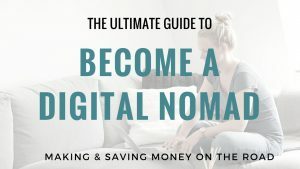 If you’re thinking about doing a cycling trip in Myanmar, make sure to check my packinglist for Myanmar. Even in winter season it gets really hot in Myanmar. Also, cycling in shorts is fine, but you need to cover up for the monasteries and temples. 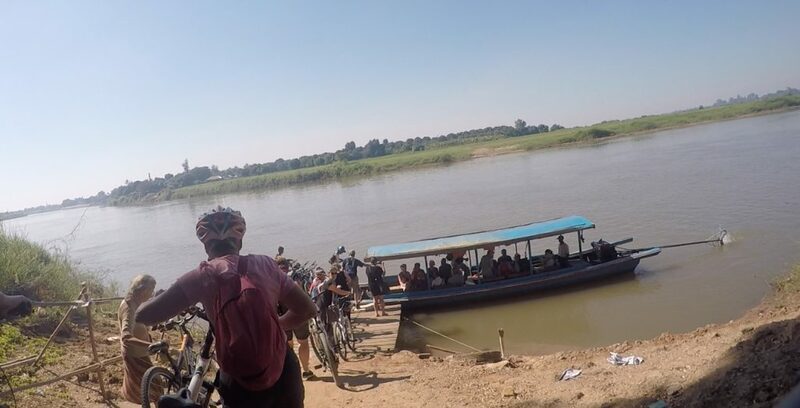 After Amarapura, we hopped on our bikes again and departed to Ava (also known as Inwa). We had to take a small ferry boat to get there which was very exciting with all the bikes 🙂 . Loading all the people and all the bikes took two turns, and coming off the boat it was time for lunch. 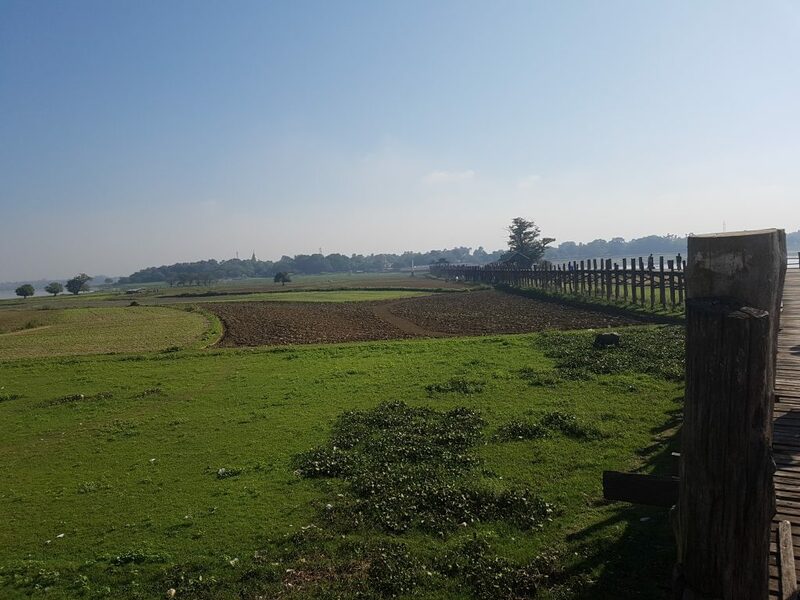 It was lovely cycling through Ava, with many beautiful sites. We visited the teak Bagaya Kyaun Monastery which was quite a sight. Then we moved on to the Maha Aung Mye Bom San Monastery which for me was one of the highlights temple-wise! 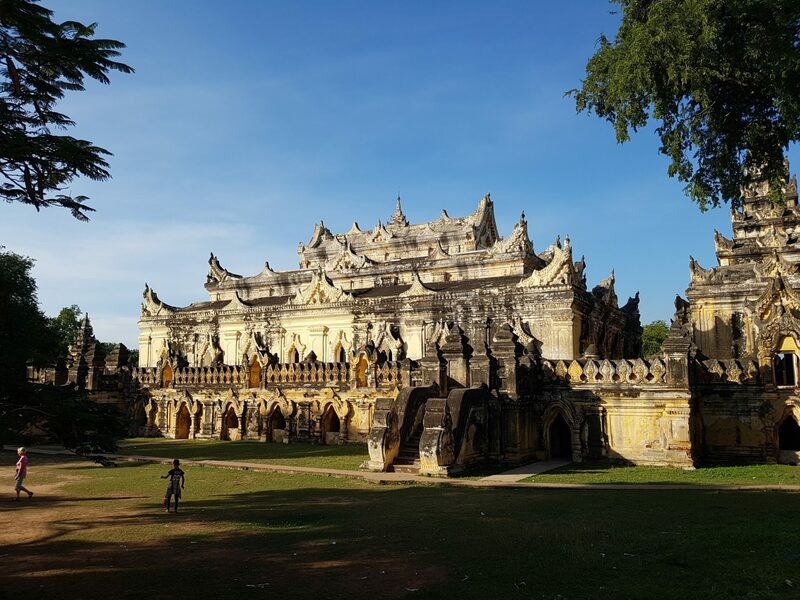 A stunning old building with some white stupas on the side. We made a quick stop at the “leaning tower of Ava” Nanmyin, which you really don’t have to put on your to-do list. I would skip this any time :D.
The next morning we had an early breakfast before taking off again. 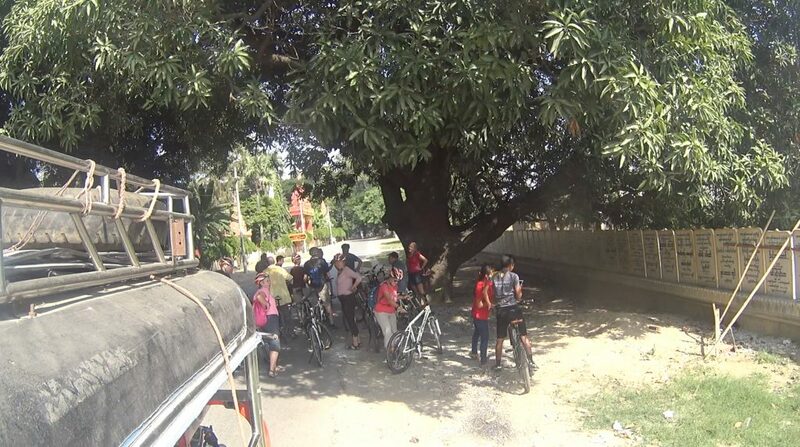 We cycled to the foot of Sagaing hill. Here we parked our bikes and made a pretty horrific hike up 350 steps 🙂 The views were pretty but the Pagoda itself was nothing fancy compared to what we had already seen. Making our way down, time for a quick snack and drink and then back on our bikes! 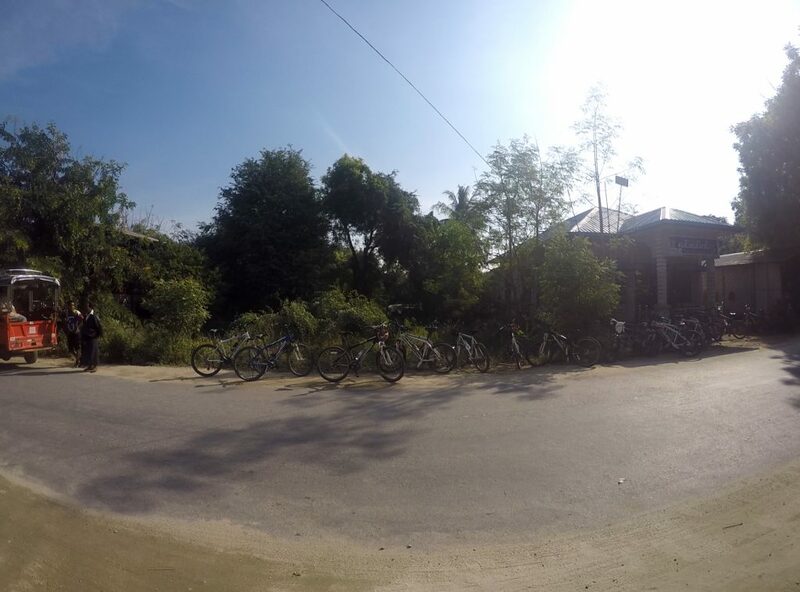 After leaving Sagain, we set off for an amazing ride across rural Myanmar. Opposite to the day before that was filled with traffic and scary situations, the second day guided us through a hilly area with little villages along the way. 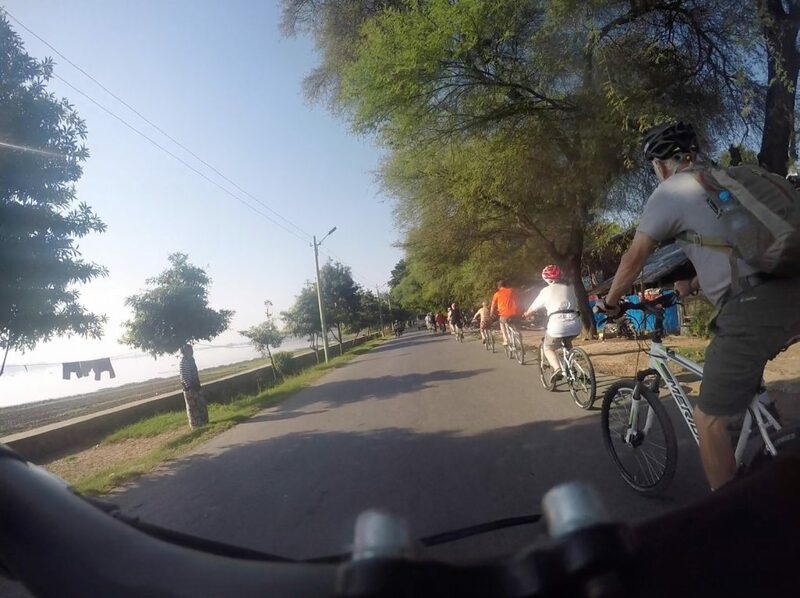 The sun, the scenery and the people on the way made it a pure joy to ride around. After a couple of hours cycling, we arrived in Mingun. 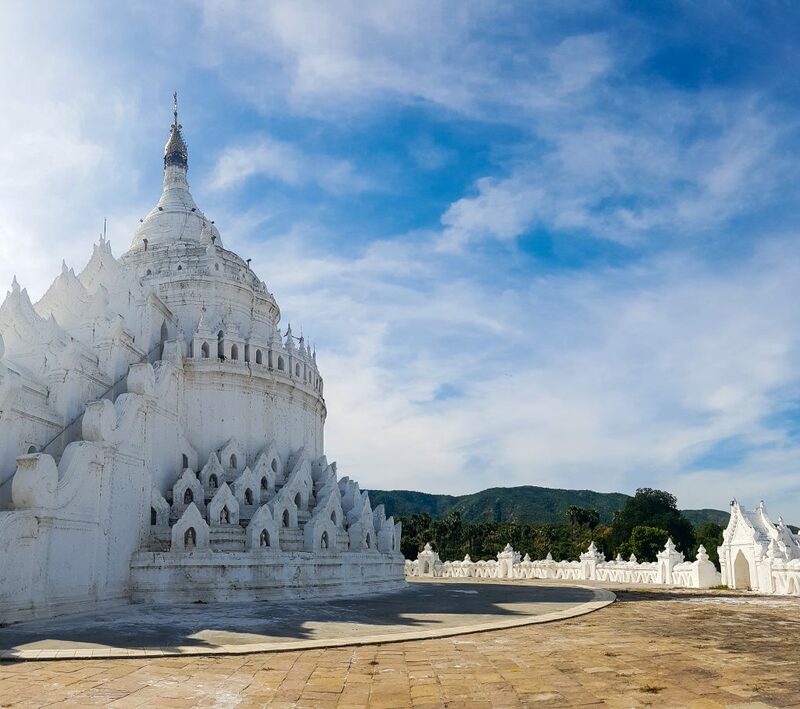 Here we visited the Mingun Paya, which could have been the biggest stupa in the world. That would have been the case, if the king would have had the guts to finish it. An astrologist told him that if he would finish, he would die. Eventually he died anyway, but the stupa was never really finished :-). 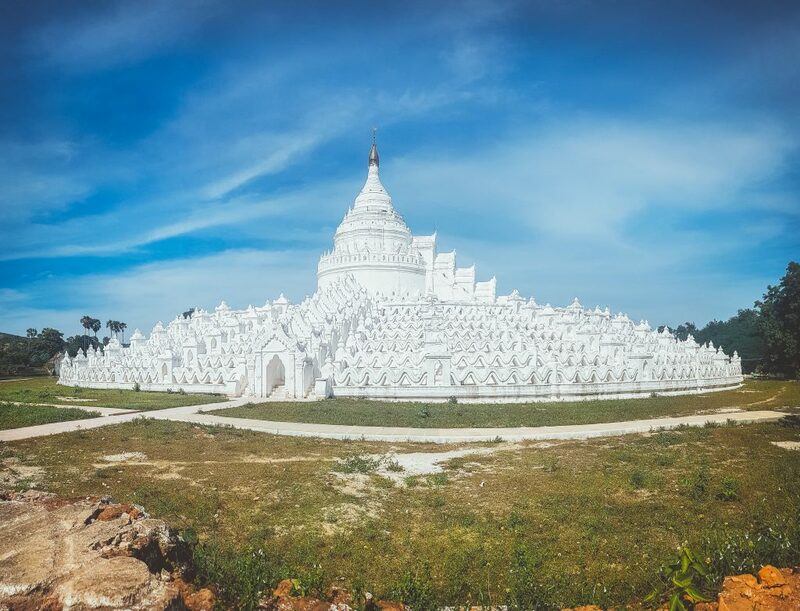 With the normal decay and some extra cracks due to an earthquake, as Lonely Planet puts it, “the Mingun Paya is now often described as world’s largest pile of bricks”. After a hot day, we were pleasantly surprised with a luxurious boat back along the Ayeyarwady River to the hotel. A hot shower and an awesome dinner at local barbecue joint “Shwe Khing Barbecue” ensured a great night of sleep. 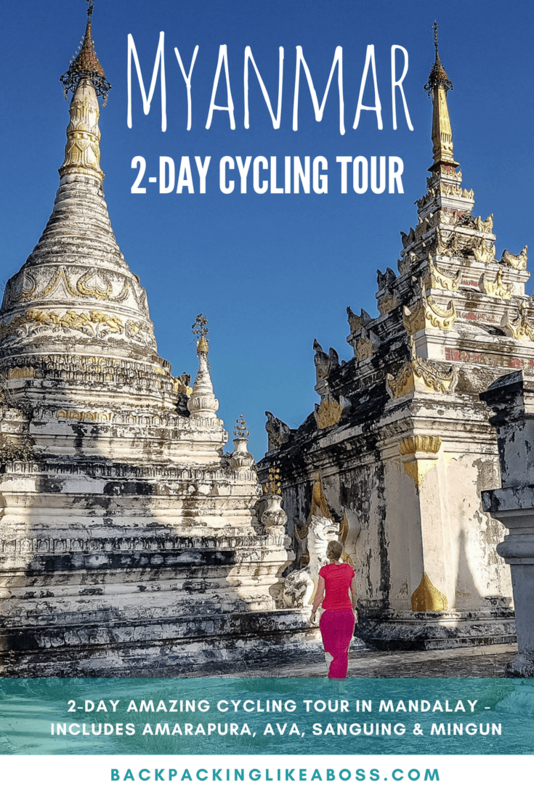 Cycling through the countryside and villages in Myanmar was truly amazing! This was such a great adventure! 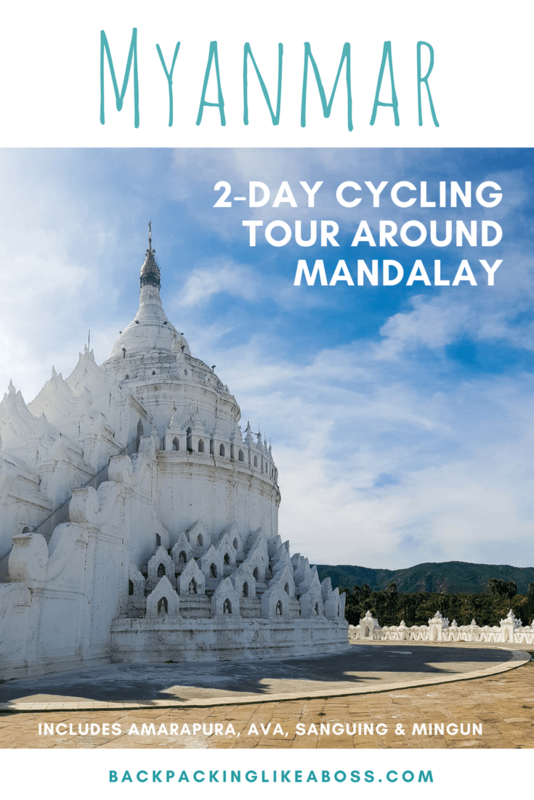 I had 3 weeks in Myanmar, but even if you only had 1 week in Myanmar and would visit Mandalay, I would still try to cram in a small cycling tour. 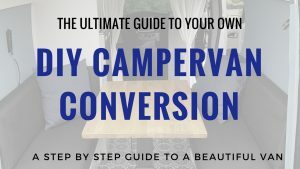 It really gives you a different perspective on the country! The tour we did was not a fixed tour, but was custom made for our group, and you can always ask for a custom tour if you are with a couple of people. 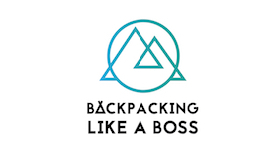 In addition, Grashoppers has about 15 other tours in Myanmar that are worth checking out! 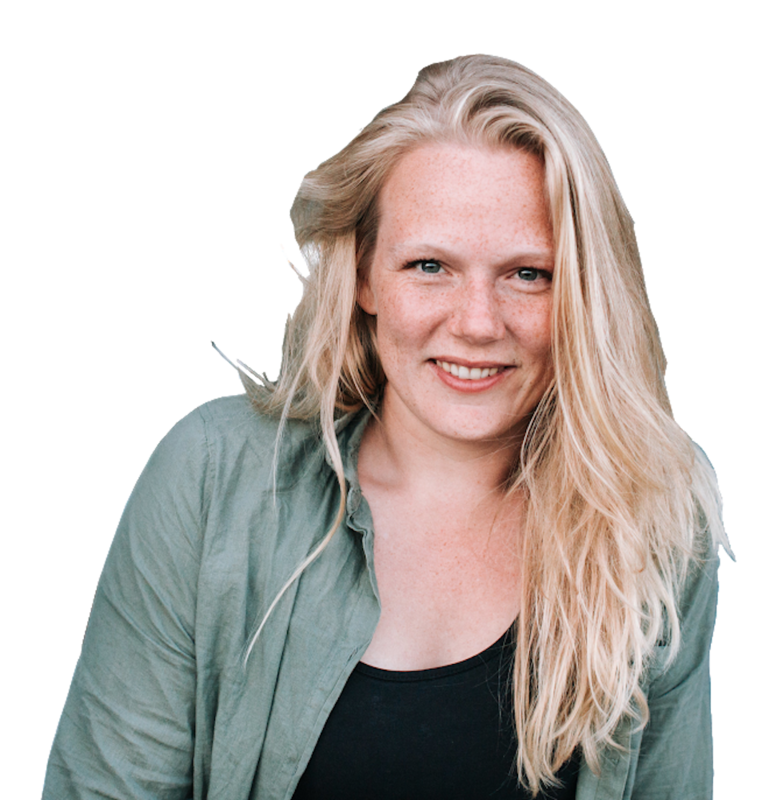 Everything was very well taken care of – the biks were in decent condition, there was a mechanic in case a bike would break down. Also a large jerrycan of water was at our disposal in case we would run out.